The only problem is that I’m not so keen on this “grown up” thing – there are too many darn responsibilities. But, one of the redeeming qualities about being a grown up is the ability to eat ice cream whenever I want, straight from the container, in a bowl, or better yet, out of the ice cream maker. I even get to decide that ice cream is dinner. Or lunch. Or Breakfast. Hell, I’m my own boss, and I make the rules. It’s pretty awesome. So in my “grown up” book, ice cream can satisfy any meal you want. Some flavors are more apt for breakfast, others for an after dinner treat. Just ask The Husband. He knows. The other day I caught The Husband leaving for work when I noticed that he had sugary crumbs on his face and chocolate smeared on the corner of his lip. “Did you just eat a cookie for breakfast?” I asked him accusingly. A guilty look plastered his face. I caught him red-handed. “What? It’s a balanced breakfast.” OK. That’s totally false, but he’s a “grown up” and as such, he can decide what to eat and when. So there you have it. Eating ice cream for breakfast is totally acceptable! If we can do it, so can you. Now that I’ve convinced myself that ice cream is a perfectly appropriate meal (and I’m very good at convincing myself of this!) it’s time to talk about the recipe. Over the past few months I’ve come to learn quite a bit about the history of ice cream. In fact, lately I’ve been having a lot of fun researching the origins of these sweet treats and frozen concoctions. I’m not sure whether I’m thirsty for food trivia, or whether I’m a masochist for wanting to know all the ingredients in these creations in order to feel bad about myself for eating them all the time. Jury’s still out on that one – but either way, it’s still pretty cool to know the history of the food we consume. So, it might not surprise you to learn that the Graham cracker was actually named for Reverend Sylvester Graham in 1829. Originally marketed as “Dr. Graham’s Honey Biscuits” these wafers were conceived as a health food and were the staple of the Graham diet. This regimen was created in order to suppress unhealthy, carnal urges – the source of many maladies, according to Graham. Well, good ‘ole Reverend Graham was onto something because his graham cracker became extremely popular! Today graham crackers are everywhere, making appearances in cheesecake crusts, ‘smores, ice creams, pies and more. Nice work Reverend Graham, you really left a legacy. Adding the sugar and whisking the egg yolks. Let the tempering begin! 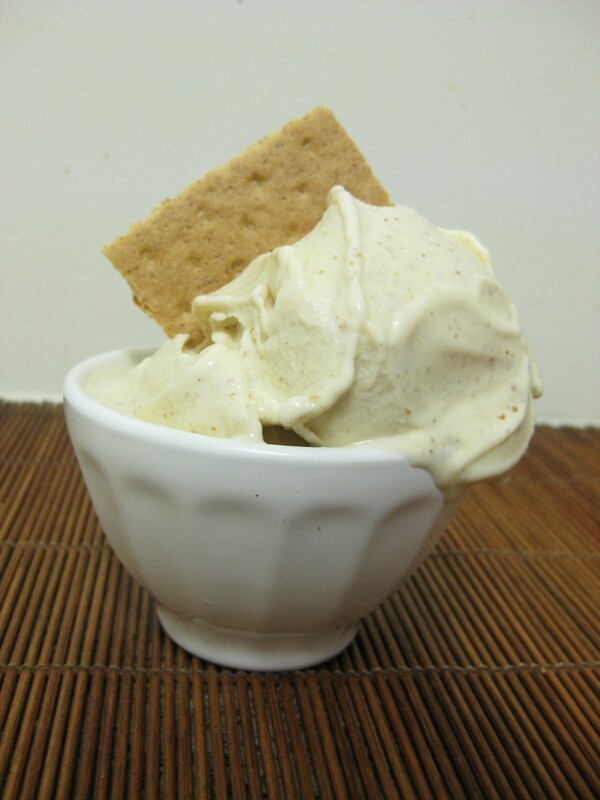 This graham cracker ice cream was a special request from the ultimate graham cracker love. Graham crackers are literally this girl’s favorite thing…ever. I guess it’s sort of like my love affair with chocolate and caramel. 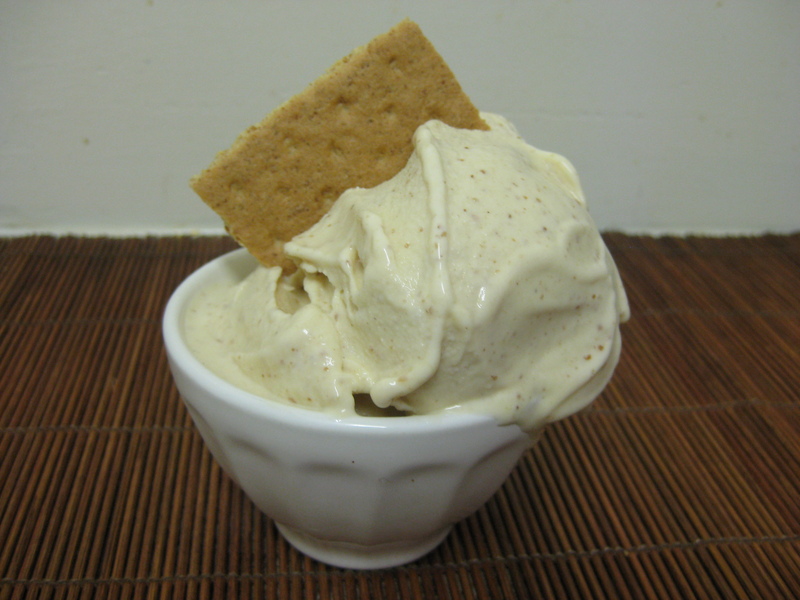 So it seemed only fitting to make a graham cracker ice cream in her honor. I searched high and low for a good recipe and when I came across this one from Christina Lee I knew it was a winner. Rumor has it that the graham cracker connoisseur agrees! 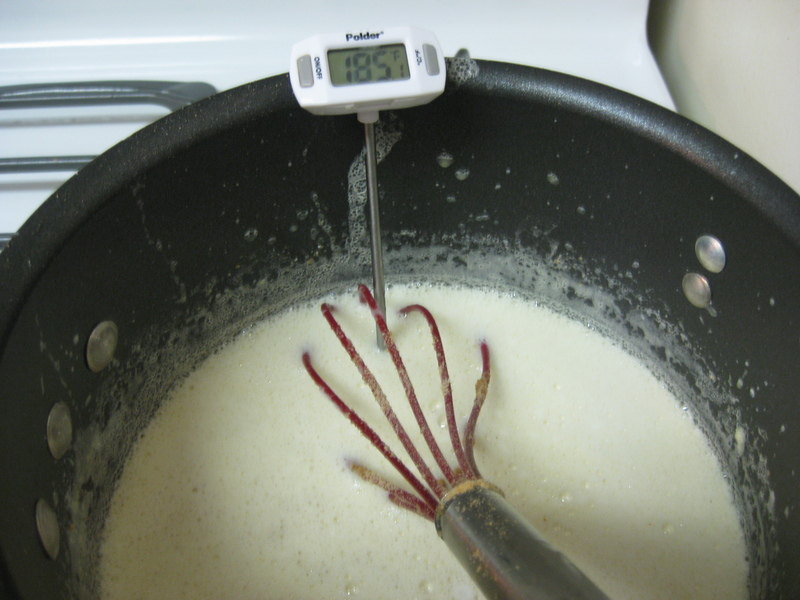 It's important to fully heat the egg/milk mixture after tempering the eggs. No one wants salmonella ice cream. Heat milk and cream to a scald and then turn off the heat. 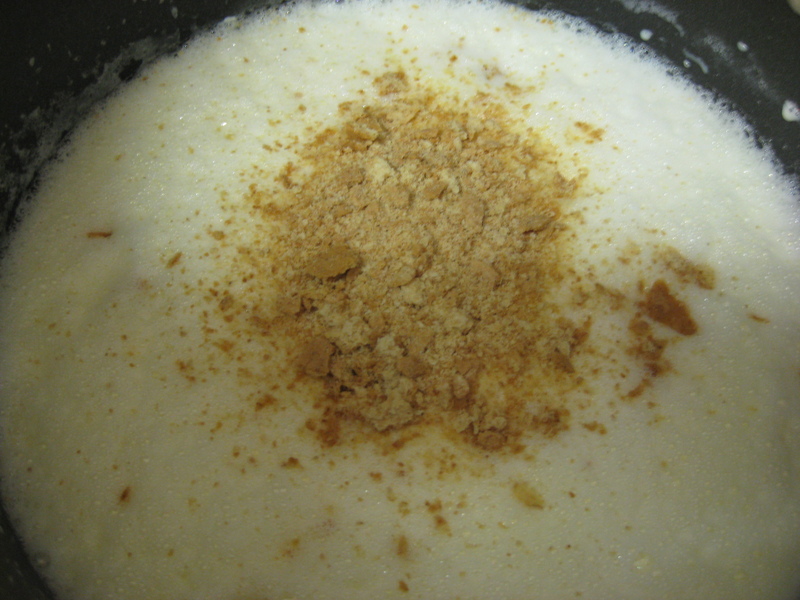 Crush the graham crackers and add them to the hot milk mixture (they will dissolve rather quickly in the milk). Stir thoroughly until the crackers are dissolved. 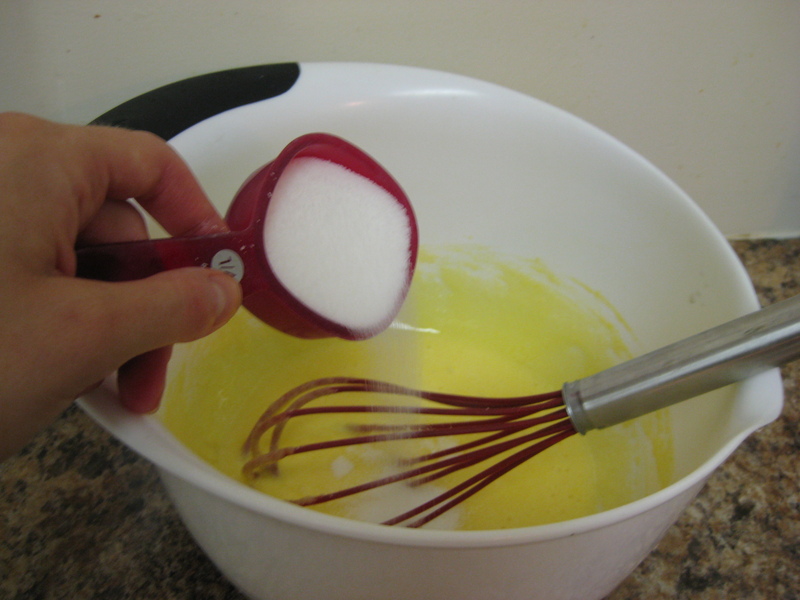 In a large heat-proof bowl whisk together the egg yolks and sugar. As you slowly add the sugar the eggs will thicken tremendously and also turn paler shades of yellow. Very slowly pour the hot milk mixture over the yolks to temper. Whisk together. Next, pour the egg and milk mixture back into a sauce pot and cook while constantly stirring until thickened. This mixture should reach 185 degrees F* so that the eggs are fully cooked. *Some recipes say 170 degrees, other say 185 degrees. Personally, I have found that either is fine. Be careful – if you heat the mixture to 185 degrees do not to overcook or else you will definitely scramble the eggs. And nobody wants scrambled egg ice cream. Trust me, it’s gross. 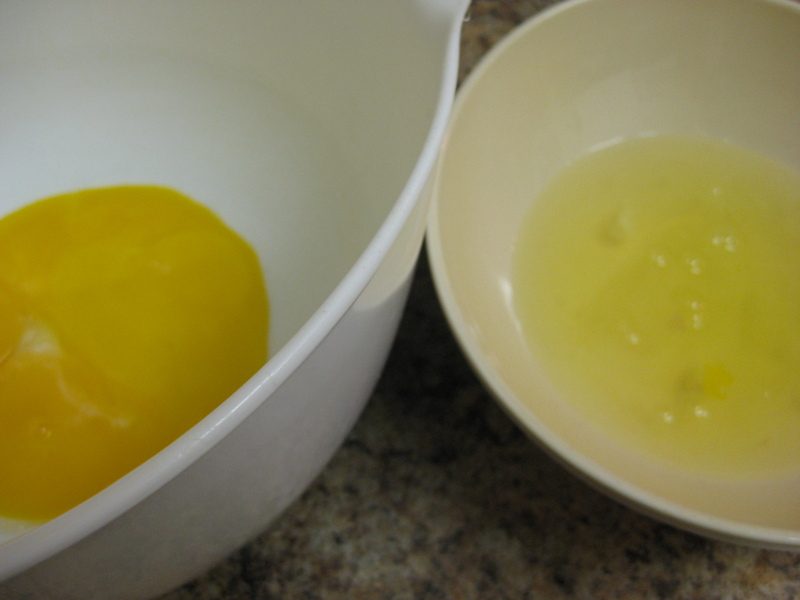 Remove from the heat and strain the mixture into a bowl to remove any small egg clumps (aka small pieces that look like scrambled eggs) that may have formed during the tempering process. Let the mixture cool completely and then refrigerate for at least 2 hours or overnight. Pour the mixture into an ice cream maker and churn according to the manufacturer’s instructions (approximately 20 minutes). Once set, transfer to a freezer safe container for storage until ready to serve. Graham cracker ice cream straight out of the ice cream maker. So creamy and smooth! The Verdict: This ice cream would make Reverend Graham proud! While you could definitely taste the graham crackers, I would suggest adding 1-2 more next time. Initially I was afraid that the ice cream would taste soggy from the crushed graham crackers, but because they were added to the hot milk mixture and then whisked into the eggs, they dissolved beautifully and in turn provided a great flavor. So, grab a spoon and dig in. If you want to use this ice cream as a base for ‘smores, smother it in your favorite chocolate sauce and a dollop of Marshmallow Fluff. You won’t be disappointed. Enjoy!